Gaslight (1944) (aka The Murder in Thornton Square) is a superb, definitive psychological suspense thriller from 'woman's director' George Cukor. [Previous Cukor films that were similar as period dramas included Little Women (1933), David Copperfield (1935), and Camille (1936).] The lavish and glossy MGM film, with authentic Victorian-era production design, was a remake of a taut and subtle film made four or five years earlier in Great Britain. This earlier version, starring a very sinister Anton Walbrook and Diana Wynyard, was directed by Thorold Dickinson and released in the US as both Gaslight and Angel Street (1940). When MGM decided to remake the film, it bought the rights to Dickinson's version and withdrew it from circulation (and reportedly - and unsuccessfully attempted to destroy prints of the film) - causing resentment among British film-makers. The film was advertised as "the strange story of an international criminal's love for a great beauty," and "the strange drama of a captive sweetheart." The film's plot, faithfully adapted by its screenwriters, was about a diabolical, Victorian criminal husband (Charles Boyer playing against type) who systematically and methodically attempts to torment, menace, and drive his bedeviled, fragile wife (Ingrid Bergman) mad. Its title was derived from the frequent dimming and flickering of the gaslights. 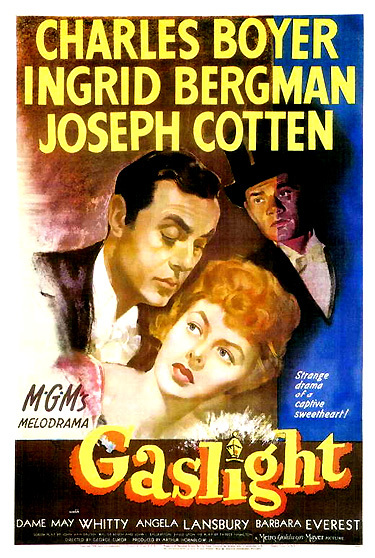 The phrase "to gaslight" someone (to deliberately drive someone insane by psychologically manipulating their environment and tricking someone into believing that they are insane), was derived from the film. The MGM film was nominated for a total of seven Academy Awards with only two wins: Best Actress (Ingrid Bergman), and Best B/W Art Direction (for the superb set of the recreated Victorian town house). [Some considered Bergman's Oscar win, her first of three career wins, as a consolation prize for her loss the previous year for For Whom the Bell Tolls (1943) and as a reward for her starring role in the Best Picture Casablanca (1942).] Bergman was very effective in the role of the vulnerable young wife who becomes helpless as she experiences a debilitating nervous breakdown and near insanity while living with her mysterious husband in the home where her beloved aunt was murdered. The other five nominations were Best Picture, Best Actor (Charles Boyer), Best Supporting Actress (Angela Lansbury, in her film debut at seventeen years old as a tarty housemaid), Best Original Screenplay (John L. Balderston, Walter Reisch, and John Van Druten), and Best B/W Cinematography (Joseph Ruttenberg). The film's impressive photography is expressionistic, shadowy, and menacing - as befits the film's ominous plot. The murder was committed in a Victorian mansion at 9 Thornton Square, where the victim's grieving and distraught young niece Paula Alquist (Ingrid Bergman) [orphaned at birth] was living. She is led from the residence in black mourning clothes and taken by horse-drawn carriage from the house. Paula is encouraged to forget her painful memories of where she was brought up, to "think about the future," and to spend time in Italy with her aunt's best friend - her new guardian Maestro Mario Guardi (Emil Rameau), a teacher of singing. After some time has passed [ten years later], Paula is a voice student taking singing lessons from Maestro Guardi, while being accompanied by French pianist Gregory Anton (Charles Boyer). She complains that she is inadequate to the task of being trained to follow her aunt's profession: "I've tried, I've worked hard, but it's no use. I haven't the voice..." When the wily Maestro remarks that she appears to be in love ("your heart is not in your singing anymore"), Paula confesses her profound happiness and love for an unnamed suitor. She is released from her training and given the chance to pursue her happiness: "Now if there is a chance to forget tragedy, my child, take it. Free yourself from the past and forget your singing too for a while. Happiness is better than art." Her love is for the suave, outwardly charming, amorous musician Gregory, but she is uncertain and untrusting of her romantic feelings for him after a courtship of only two weeks. Protesting that she hardly knows him well enough to be married, she resolves to leave and spend a holiday week by herself at Lake Como to gather her thoughts ("just to know what I'm doing, just to be sure"). On the train journey to the lakes, Paula is seated next to Miss Thwaites (Dame May Whitty), a garrulous Englishwoman who loves murder mysteries, gardening and digestive biscuits. The elderly woman is amusing herself by reading a "wonderful" murder novel about a man who married a woman while having six wives buried in the cellar. Coincidentally, Miss Thwaites lives at 16 Thornton Square, and she is reminded of the 'real, live murder" that occurred there ten years earlier: "It was a most mysterious case. They never found out who killed her. They never even found a motive." The tragic recollection of the unsolved murder case where her aunt was murdered is un-nerving to the meek and disconcerted Paula. That house comes into my dreams sometimes - a house of horror. Strange - I haven't dreamed of it since I've known you. I haven't been afraid since I've known you....For years I've been afraid of something nameless, something...Ever since she died. You've cast out fear for me...I've found peace in loving you. I could even face that house with you...Yes, yes, you shall have your dream. You shall have your house in the square. The recently-married couple return to London to move into the three-story, claustrophobic mansion. On their way into their new house on the square, their nosy neighbor Miss Thwaites greets their arrival. The aunt's bedroom on the second floor holds painful memories for Paula - the furnishings in the dark room are draped in dusty sheets: "It's all dead in here. The whole place seems to smell of death." Paula momentarily becomes upset as she remembers how she found her aunt's murdered-strangled body in front of the fireplace under her regal portrait: "No, I can't stay here." To calm her haunting memories, Gregory insists that all her aunt's possessions be boarded up and shut away out of view in the third floor attic: "Suppose we make it a new house, with new things, beautiful things for a new beautiful life for us." And he suggests that they close themselves off from the outside world by postponing plans for parties until later: "Later, yes, but not just at once. Let us have our honeymoon here by ourselves for a little longer." Gregory violently snatches the letter from her hands - things are uneasy and not as they appear on the surface. [Anton is, in reality, a single-minded jewel thief, diabolical and manipulative husband, and a murderer, who married Paula to live in the house in fog-bound Thornton Square where he had murdered her aunt years earlier.] A young, teenaged Nancy Oliver (Angela Lansbury in her film debut) is hired by Gregory to be a housemaid (for wages of sixteen pounds a year), with specific instructions to never bother Paula (the "mistress") about anything: "It may seem a little unusual, but your mistress is inclined to be rather highly strung...Your mistress is very particular about everything being very correct." The elderly cook, Elizabeth Tompkins (Barbara Everest) and the forthright maid are immediately wary of each other. To curry favor with her employer, Nancy brashly insults her co-worker: "She's...strict-like. I'm not gonna sleep in the same room with her. Did you see the way she looked at me?" For the first time in a long while, Gregory and Paula prepare to take an excursion outside their residence to the Tower of London. When they are about to leave, a doting Gregory presents an appreciative Paula with a brooch, one that he claims was a family heirloom that once belonged to his mother. He chides his wife about often losing things: "You might lose it. You know, you are inclined to lose things, Paula," and drops it in her handbag "for safe keeping." He makes a great show of placing it inside, and teasing her: "Now, you'll remember where it is." After they have left for the Tower, the cook remarks to the maid that the "master" frequently keeps telling the "mistress" that she is ill, although she doesn't appear to have anything wrong with her. During their tour in the Tower of London, the guide shows off the axe of the axeman and the grisly execution block where famous individuals in English history were beheaded. In parallel fashion, Paula panics (loses her head) when she looks in her handbag and can't locate the brooch inside. She steps aside from the tour and reaches inside her bag again and again - incredulous that Gregory's present is missing. At first, she conceals the fact that the brooch is gone from him, and then is further disturbed when he reminds her of a frequent minor transgression. She is very forgetful and often loses things due to tiredness. On their way to view the Crown Jewels, he turns things around in his favor when he accuses her of becoming suspicious and absent-minded. ...it's the most famous diamond in the world. The Imperial State Crown...it was made for the coronation of Queen Victoria. Among the jewels it contains the Ruby of the Black Prince...Jewels are wonderful things. They have a life of their own. Oh Gregory, I can't find it...I missed it when we were in the Tower...I know it was here. I can't understand it. I couldn't have lost it. It must be here...I must have pulled it out with something, I suppose. Oh, I terribly sorry, Gregory, please forgive me...But your present to me, your mother's brooch. And I wanted to wear it - always. I-I-I don't remember opening my bag...Suddenly, I'm beginning not to trust my memory at all. In a mild, denunciatory reproof of his worried-sick wife, he tells her that his fears have been confirmed: "Oh Paula, didn't I tell you? How did you come to lose it?" But he further consoles and comforts her, arguing that she's only tired: "It doesn't mean anything. I'm sure it doesn't. Don't worry so, Paula. Don't worry." Later that evening, while Gregory is presumably practicing the piano and composing in a rented apartment nearby, Paula insists to Nancy that the gaslights dim in her bedroom: "That's odd," but her maid claims that she didn't turn the gas up in another room: "I never touched it." Her fears are heightened when she hears strange noises like footsteps from the third floor attic (the entrance has been boarded up) where all of her dead aunt's furniture and possessions are stored. They never have visitors. Never go out anywhere, at least she doesn't...It's an odd household, too. That maidservant - most impertinent. I can't get a thing out of her. She won't talk to me, though she would quick enough if I wore trousers. The way she carries on with that policeman on the beat. It's scandalous! At just that moment, Paula appears at her front door hesitant about taking a walk by herself outside. The saucy maid reinforces Gregory's plotting to keep Paula isolated by questioning Paula about her wishes to go out. The persistent maid threatens to tell Gregory and incur his wrath, causing her further paranoia and preventing her from leaving. Nancy: Suppose the master comes back and asks where you've gone? Paula: Well, tell him I just went for a walk. Paula: Of course, why not? Nancy: Suppose the master asks where? Cameron, who had earlier caught sight of Paula walking in the garden of the Tower of London with Gregory and was intrigued by her uncanny resemblance to her opera-singer aunt, is enamoured enough of Paula to look into the files of Alice Alquist's long-ago, unsolved murder case. He tells the Commissioner at the Yard that he was a long-time admirer of Paula's aunt: "I once met Alice Alquist. I was taken to hear her in a command performance when I was twelve years old, then afterwards to meet her in the artist's room...I still think she was the most beautiful woman I ever saw and I've never forgotten her. And now ('now you've seen someone you think looks like her') living in the same house." Interested in and sympathetic to the young niece's predicament, the detective feels that something "peculiar" is going on there, especially when he learns that the victim's jewels (crown jewels from another country's royal head given as a present to the opera singer) were unaccounted for. The "official theory" was that Miss Alquist was murdered during an apparently unsuccessful attempt to steal the jewels - valuables that were "much too famous for him [the murderer] to be able to sell them anywhere." Cameron decides to unofficially reopen the case and give an under-cover surveillance task to a policeman named Williams (Tom Stevenson) - to work the beat around the Thornton Square area. Gregory: You're looking very pretty this afternoon, Nancy. Do you know that? Nancy: I don't know it at all, sir, I'm sure. Gregory: Tonight is your night out, isn't it? Gregory: And who are you meeting tonight?...I see they've changed the policeman on the beat. Is his heart going to be added to the list of those you've broken? Nancy: I did not broken any, sir. Gregory: Oh, now, I'm sure that's not true. And that complexion of yours. That's something that's not quite true, either. Oh, you do it very cleverly, I grant you. In fact, I was wondering whether you might not care to pass some of your secrets on to your mistress and help her get rid of her pallor. Nancy: Sure, I'd be very pleased to do anything I can, sir. When Paula becomes agitated and self-doubting, Gregory accuses her of becoming delusionary and imagining things again: "If you start talking about the way Nancy looks at you...Do you really think Nancy despises you?...It hurts me when you're ill and fanciful." Gregory also forbids Paula to see their visiting neighbors, "busybody" Miss Thwaites and her nephew (play-acting Brian Cameron), supposedly because she is not well enough to receive anyone: "My dear, if you let her in once, you'll always have her here...I DO NOT WANT PEOPLE ALL OVER THIS HOUSE." Later, Gregory manufactures an excuse for dismissing their neighbors ("keeping people away from you, making you a prisoner") - it's because they have plans to attend the theatre for the evening. He playfully reminds his 'forgetful,' long-suffering and tormented wife that he is merely disciplining her thoughtlessness. Alternately, however, he cruelly denies her concerns and persecutes her as part of his meticulously-planned campaign and plot to destroy her sanity. In another confrontative assault of icy disapproval, he points to a bright, square rectangle on the wall and accuses his fearful, paranoid wife of stealing a framed picture from there - and then forgetting where she placed it: "Will you please get it from wherever you've hidden it and put it back in its place?" When Paula becomes hysterical under the pressure, he summons and questions both servants who deny any involvement. If it was I who took that picture down...if it was I who took it down the other times, if I do all these senseless, meaningless things, so meaningless, why should I take a picture down? But then, I don't know what I do anymore...But then, if that's true, then you must be gentle with me. You must bear with me, please. Oh please, Gregory, please! Nancy: Gonna work on your tunes again tonight, sir? You're always working, aren't you? Gregory: I've never been to an English musical. Gregory: Oh, now you know Nancy, don't you, that gentlemen friends are sometimes inclined to take liberties with young ladies. Gregory: You know, Nancy, it strikes me that you're not at all the kind of girl that your mistress should have for a housemaid. Nancy: (flirtatiously) No, sir? She's not the only one in the house - is she?